If there is something that is quite same with human beings, wild animals, reptiles or even mythical stories then the first and foremost thing is ‘Mother’s Love’. Earlier we noticed a photograph of PM Modi having breakfast with his mother after a long time, the grace and heartfulness of that moment are same even for a Prime Minister of the country, that love stimulates any living being so keen and deep. Back in November 2017, a leopard was beaten to death by villagers in Haryana and the forest department officials watched the incident helplessly. This cruel incident raised ambiguity within government if forest officers are really capable of aiding the wild animals. But this video will reaffirm your faith in humanity and will encourage others to do the same for the animals. Contrary to that incident, here is a situation which makes you feel pleasant with the kind of bonding human beings can have with the wild animals, this video will reaffirm your faith in humanity and will encourage others to do the same for the animals throughout. The video of the villagers reuniting the Leopard with its kids with the help of the respective forest officers is going viral for the right reasons assuring the existence of humanity now and then. Coming to the details, farmers spotted two three-week-old cubs in a sugarcane field near Somatwadi village near Pune. The baby leopards were found by the local people while they were harvesting the crops. 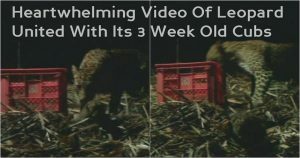 The Wildlife SOS team and the Maharashtra Forest Department were called in by the villagers who were scared as reportedly the mother leopard was lurking nearby in search of her babies. Soon after acknowledging the farmers call, the forest rangers team rushed to the spot and after proper medical examination of the little cubs, the team decided to place them in safe crates in the same location where the mother was last spotted. In a bid to document the real emotional reunion, authorities placed the remote cameras and lights in the nearby premises. The video shows the mother removing the cover and gently lifting the babies with and mouth. The mother disappeared into the woods after securing her babies and did not disturb or harm anyone. This incident took place after a few months of Haryana issue, it must be accepted that the former incident reflects the incapability of the people and inefficient working ideology of the officials and the latter is quite opposite. One thing is quite clear, humanity exists forever!